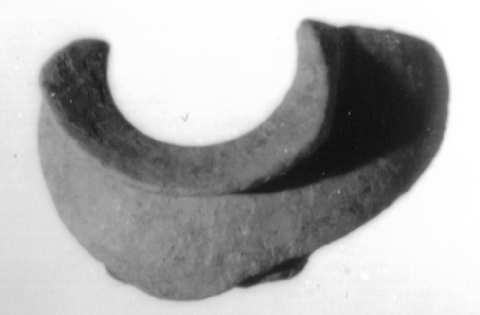 Description The fragment preserves a portion of the rim and shoulder of a grayware pyxis. The rim, 0.009 m wide, slants outward and sits on a very small neck less that is than 0.001 m high. The shoulder of the vessel gently curves downward from the neck. At two points along the shoulder a sufficent portion of the wall is preserved to identify a change in the curvature. Rather than continuing to curve downward the walls turn sharply inward toward the interior of the vessel creating a sharp angle in the body of the vessel.